On the Eve of the Trans-Pacific! It’s been a busy week here in Long Beach, California! The harbor has been abuzz with boats and sailors, spectators and press as we complete our preparations for Bodacious IV to compete in the 107-year old Transpac Race! 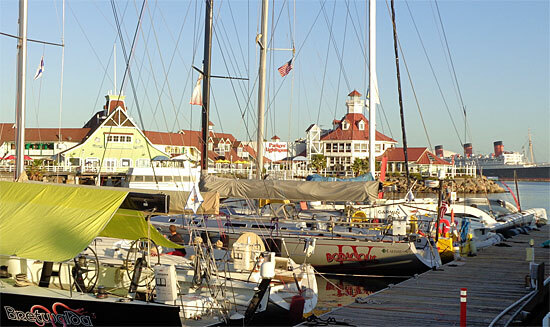 We arrived in Long Beach after having developed a problem with the mast during the trip from San Diego, which upended all our well thought-out plans and schedules. After consulting with engineers and technicians, repairs were completed this past Sunday, and since then, we’ve been working to catch up and get back on schedule. Yesterday, Captain Tim Eades and I were joined by the rest of the Bodacious Racing Team, and we are now at full strength going into the final stretch. The proverbial “list” is now close to manageable, we’ll get in a practice sail today and be ready to rock it come our start tomorrow Thursday at 1:00 pm, PDT! Bretwayda, Bodacious IV, Lending Club & The Queen Mary! There’s an amazing group of competitors and vessels around us here, and we’re expecting some very close racing right up to the finish line. The whole race has a total of 57 boats competing in three sections with staggered start times. This is to help consolidate the finish times in Hawaii by having the faster boats give the rest of the field a head start. The first start was on Monday, and in that start was our friend and fellow Class 40 racer Hanna Jenner onboard Dorade, which is a very special boat, having won the Trans-Pac back in 1936! 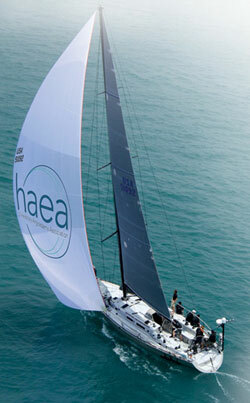 Another fellow Class 40 competitor, Ryan Breymeier, will be competing in the large trimaran, Lending Club. They have been upgrading their onboard systems in an attempt to set a new multi-hull record time for covering the Transpac course in less than 5 days! We’ll see how they do. We’ll also be keeping a close eye on an old friend, Phil Pollard, who is sailing on Bretwalda 3. Concurrent to the race, we have also uploaded a Trans-Pacific Expedition discovery “module” here on BodaciousDreamExpeditions.com … this one naturally covers the Pacific Ocean and Hawaiian Islands. Here we give you background and study guides to help you share with the kids in your world, what’s going on around our daily updates as we venture across the largest ocean on the planet, the Pacific Ocean. In the “print-ready” Explorer Guides, you can have some fun working out the math problems and reviewing the general knowledge questions. It’s an utterly amazing part of the world we will be voyaging through, so come along and learn about it with us … in real-time! 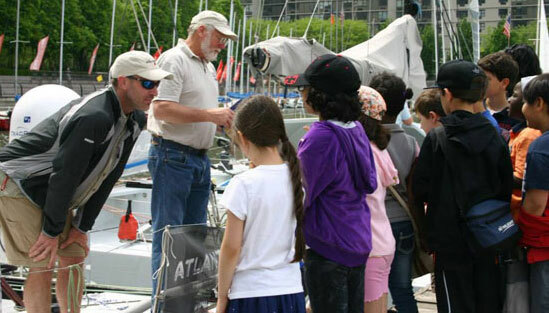 Speaking of sharing our experience with a younger generation; this is at the heart of what we do as sailors and humans. On this note, the good folks at the Atlantic Cup and 11th Hour Racing were kind enough to ask me to write a piece for them on the two “Education Days” we had in-between Atlantic Cup race legs. On those two days, several of us skippers had a chance to hang out and share our experiences with groups of city school kids. It was a very special experience. My post is titled, “If I knew then, what I know now …” and you can read it right HERE! The folks at the Transpac have also done a good job enhancing the online experience for you, as well. Here are some of the various ways you can follow the action. Of course, we will (in our own inimitable way) be keeping you updated here on our Bodacious sites and on our Facebook page as well. So, that’s about it … there’s a LOT of excitement coming up in these next couple of weeks of hard racing. We’re hoping to cover the 2250 miles in 10 days or so, after which it will be time for a few days of rest and relaxation in Hawaii before heading back into the thick of things in preparation for the circumnavigation aboard Bodacious Dream in the fall! We hope you’ll take time to follow us on this grand race and adventure, explore our expedition materials and also support our good friends at the Earthwatch Institute … and if you can, help out our partners at the U.S. Hereditary Angioedema Association (HAEA) who are working hard to find a cure for all those affected by that disease. So … until the next update, all the best to you, from all of us onboard Bodacious IV! This entry was posted in Bo IV, Bo IV crew, Bodacious Dream Expeditions, Dave Rearick, Matt Scharl, Trans-Pacific by oceanexplorer. Bookmark the permalink.